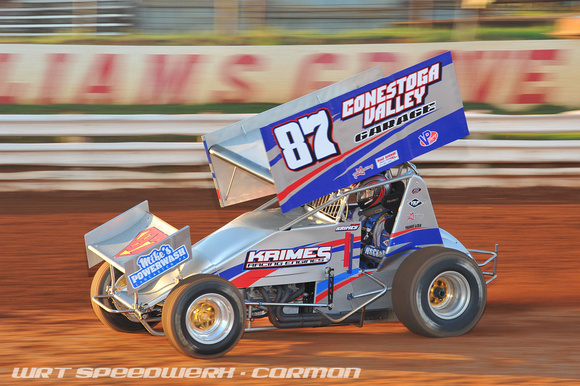 ABBOTTSTOWN, PA, 4/19/2014 – Alan Krimes summed it up best in victory lane Saturday night at Lincoln Speedway. 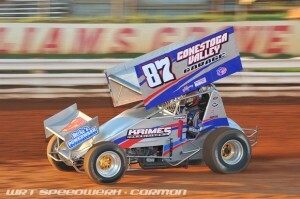 “I don’t know if I won that race or just didn’t lose it,” said Krimes after climbing from his Midnight Antiques, Conestoga Valley Garage, Krimes Racing Engines No. 87. Sprinter in victory lane following his win in the 30-lap 410 Sprint car Spring Championship. It was a race that saw several red flags and in one lap that saw nine of the top 10 running cars dropping from contention due to various reasons. But Krimes missed all of the crashes and won the battle of attrition to score his second straight victory in as many weeks and upped his career total to 15 in the Pigeon Hills. All of the craziness started on lap five when Steve Owings spun, collecting Nathan Berwager, and Brian Montieth who flipped. Aaron Ott also flipped in turn three after a reported stuck throttle. On the restart, Tim Wagaman and Adam Wilt tangled collecting point leader Danny Dietrich, who did everything but flip on the front stretch. Second-place running Billy Dietrich then stopped on the next restart which made him the ninth car inside the top 10 to drop out. That left only Will Rose, who had led the race from the green flag, the lone top 10 car on the track. When the dust settled, Krimes, Jim Siegel, Brent Marks and Robbie Kendall all entered the top five with Krimes storming by Rose to take the lead with six laps complete. Krimes continued to lead Siegel as the pair closed on lapped traffic when Tyler Ross and Wilt tangled in turn three right in front of the leaders. Siegel took evasive action to miss the incident but Marks wasn’t as lucky and spun into Wilt. Montieth advanced through the field after his flip to move into the top five on lap 18 and then took fourth on the next circuit. But that would be as far as Montieth, the four-time track champion, would make it as Krimes held off Siegel in heavy lapped traffic over the final few laps to pick up the win. Siegel finished in the runner-up spot ahead of Kendall, Montieth and Gerard McIntyre, Jr.
Kevin Nagy crossed in sixth with Freddie Rahmer getting his best career finish in seventh over Danny Dietrich, Austin Hogue and Cory Haas. Sprint car heat races were won by Siegel, Dietrich and Ott with Marks topping the consolation for the 29 car field. Kevin Nouse raced his way from his 12th starting spot to score an impressive win in the 20-lap feature for his second win in-a-row at Lincoln in 358 Sprint car action. The Mechanicsburg driver worked his way into second spot by lap eight and made the race winning move by Jay Galloway on the 15th lap. >From there Nouse drove away to fourth career win in the Pigeon Hills. Nouse did have several close calls during the feature before bringing his Bulls-Eye Express, McKeehan Motorsports No. 4R sprinter to victory lane. Galloway finished second followed by Brian Allman, Chase Dietz and Chandler Leiby with Matt Campbell, Matt Findley, Brie Hershey, Mike Bittinger and Zach Eucalano rounding out the top 10 finishers. Heats for the 27 358 sprint cars were won by Rick Horn, Nouse and Dietz with Tyler Esh topping the consolation. At the age of just 15, lady racer Michelle Walls captured his first ever street stock feature win in the only appearance of the season by the division this season at Lincoln. The Gettysburg driver started fourth and took the lead on the 12th lap from Gary Potts and held on over the final eight laps in the win over Potts, Walt Lemmon, Bob Scott, Jr. and Chris Heller. Street stock heat wins went to Gary Potts and Bob Scott, Jr.. There were 12 cars pitside. Next Saturday, April 26th, it will be another three-division show as the Lawrence Chevrolet 410 Sprinters will be joined by the 358 Sprints, and Central PA Legends. Racing gets underway at 7 PM, with gates opening at 5 PM.